Because there are over 40 different species in the dolphin family, it is not surprising that there is a good deal of variety in their diets. Species included in the dolphin family range from river dolphins to both coastal and offshore oceanic species. Factors that influence what dolphins eat include what food species share their habitat, the number of calories a particular dolphin species needs to sustain daily life, the shape of their nose or rostrum and the size or type of their teeth. The most common dietary staple of many dolphins is fish. Some more pelagic, or deep water dolphins also commonly eat squid or jellyfish. Because of their curious and playful nature, dolphin diets often consist of additional items they accidentally ingest while playing with or examining them, such as pieces of seaweed, small rocks, small shellfish or other invertebrates. Unfortunately dolphins sometimes mistake plastic debris for food items and eat them. This is a common cause of death in individual strandings. The types of food that dolphins eat varies with the region in which they live. Favored food species among Atlantic bottlenose dolphins along the coasts of Florida include mullet and catfish. Indus River dolphins eat freshwater fish, such as gobies and carp. The southern hemisphere's Dusky dolphins eat shrimp, squid and various fish, even including tiny anchovies. River dolphins are known to eat crustaceans and freshwater fish, while pelagic dolphins, such as the rough-toothed dolphin, that live in the deeper oceans eat more squid. Spinner dolphins eat fish, jellyfish and krill -- a type of small shrimp. Most dolphins are opportunistic feeders that will eat whatever aquatic food species are common in their territory. Killer whales, the largest member of the dolphin family, are known to eat fish, but also will consume other sea mammals, such as seals and sea lions and other dolphin or whale species. A major factor in determining the diets that are fed to captive dolphins is availability. Most captive dolphin facilities are limited to what is available fresh through local fisheries or frozen from large, commercial fisheries. 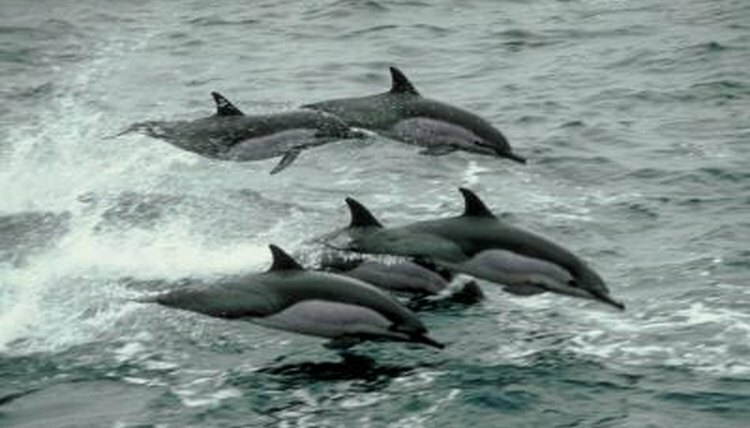 Fortunately, many common dolphin dietary items such as fish, shrimp, squid and crustaceans are widely available. Trainers prefer small fish such as smelt since they can easily offer many small rewards with them instead of having to cut larger fish into smaller portions. Dolphin-World.com: What Do Spinner Dolphins Eat? What Kind of Dolphins Live in the Atlantic? What Species of Dolphin Eats Eels? What Kind of Animals Eat Sardines?